Home > Blog > Where to buy a Service Dog Vest? You are looking for a Service Dog Vest and decide to do an internet search for "Service Dog vest near me" and you come up empty. This is because Service Dog Vests are not typically available at retail locations. Service Dog supplies are offered exclusively online. Working Service Dog is the leading manufacturer for all working dog equipment. All of our supplies are manufactured in the US and are shipped from our facility in Bradenton, Florida. Who sells Service Dog vests? While there are many websites that offer Service Dog Vests and supplies you will not find a larger selection than at www.workingservicedog.com The harnesses offered are not cheap service dog vests, they are made from high quality materials and are meant to last for years to come. How many styles of vests are available? We offer approximately a dozen different Service Dog Vest styles and with 32 different patches to choose from the possibilities are endless. Not only does Working Service Dog offer a full line of Service Dog equipment like patches and ID Cards we also offer a full line of Emotional Support Animal supplies. How quickly will I receive my Service Dog vest? Unlike other online stores Working Service Dog is a manufacturer therefore making it possible to ship orders within 2 business days. 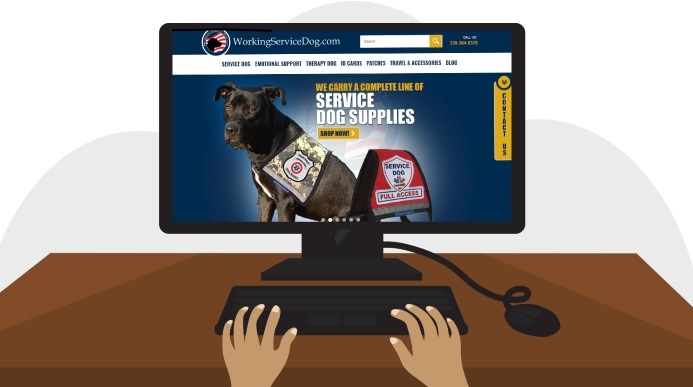 Because other online webstores are purchasing their equipment from manufactures like www.WorkingServiceDog.com it could take up to a week for your order to ship. By eliminating the middle-man your items will be less expensive and will arrive more quickly. As a manufacturer we pride ourselves on offering the highest level of customer service and are available to help 7 days a week. Purchasing your Service Dog Vest online? We have all come to enjoy the convenience of shopping from home. Things magicly appear at your doorstep within days of ordering. Long past are the days of traveling from store to store and not finding exactly what you are looking for.